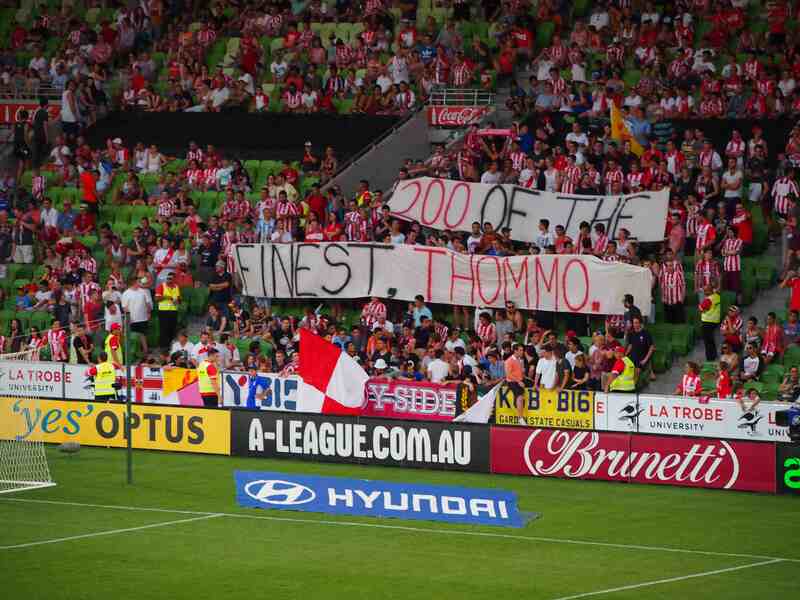 After an exciting start in which the home team could have scored several goals, Melbourne Heart eventually succumbed to a workmanlike Adelaide United, losing by two goals to nil at AAMI Park on Labour Day. With the defeat came the realisation that it will take a miracle for Heart to make the finals this year since it has games against the top two teams in its remaining three matches. Heart left out Patrick Gerhardt, Jonathan Germano and Jason Hoffman, while Adelaide had virtually its strongest line-up with perhaps the exception of Bruce Djite. Josip Tadic returned to the starting line-up for Heart and Marcel Meeuwis was preferred to Fred. The first twenty minutes of the game were open and frenetic with chances galore at both ends. Adelaide hit the frame of the goal twice, Kalmar might have had a hat-trick but for the brilliance of Eugene Galekovic in the Adelaide goal. In the second minute Tomi Juric fired in a blistering shot which Andrew Redmayne at full stretch deflected against the post and away to safety. Jeremy Walker was causing havoc down the right side and from his cross Josip Tadic headed goalwards and when the ball was rebounded Nick Kalmar thrashed it over the bar. A minute later Walker’s pass found Kalmar directly and his fierce shot was finger-tipped around the post by Galekovic. In the next attack Kalmar just dragged his shot wide of the post. Adelaide replied as Dario Vidosic shot narrowly over. 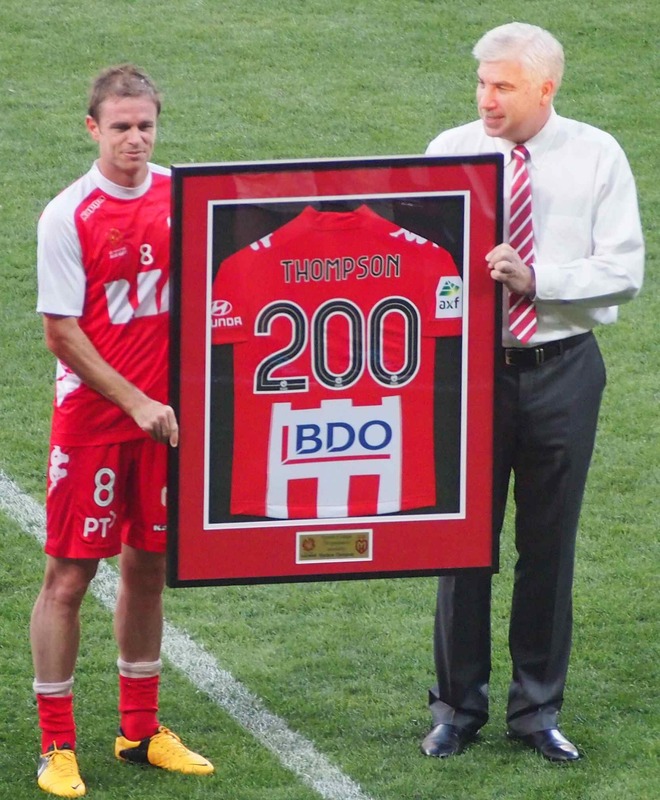 United then had a good spell in which they denied Heart the ball for long periods, but finally David Williams got clear down the left and his cross just eluded a diving lunge by skipper Matt Thompson, who was thus denied a goal on his 200th A-League game. Adelaide went up the other end and Vidosic struck the junction of the bar and post with a shot from more than 20 metres. 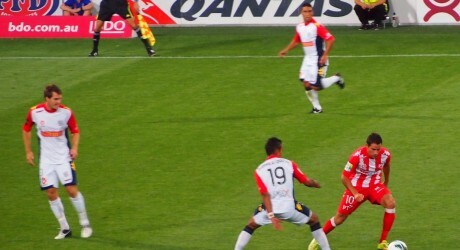 The match then took a decisive turn when Adelaide mounted an attack down its left flank. Jeremy Walker raised his foot to clear the ball and made contact with Marcelo Carrusca and the referee gave a penalty converted by Dario Vidosic in the 40th minute. Heart had a brief flurry in the last minutes of the first half, but the closest they came to a goal was a David Williams free kick which was headed away for what turned out to be a fruitless corner kick. Most people expected a Heart response in the second half and Fred replaced Meeuwis at the interval. But Adelaide nipped any revival in the bud with a second goal after 53 minutes. 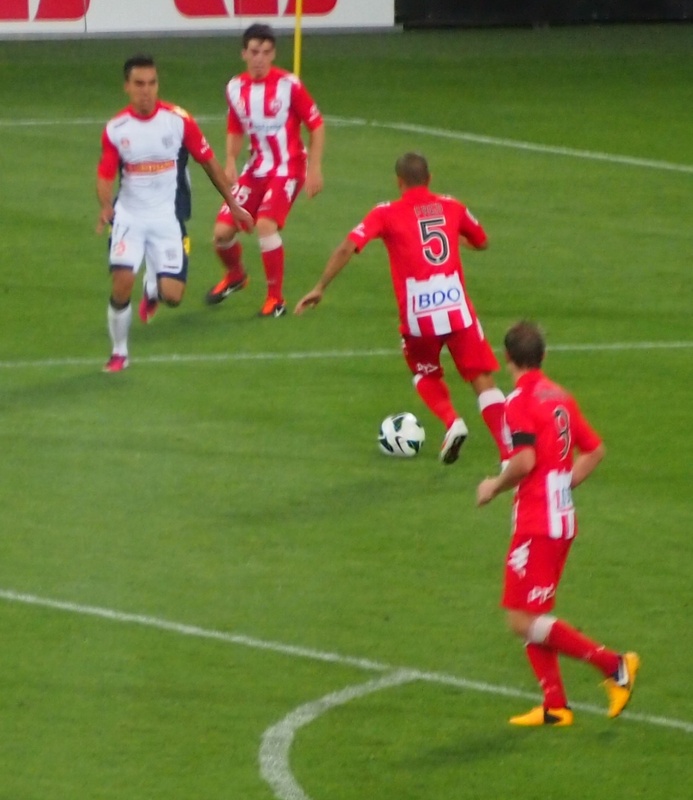 Cassio, Carrusca and Iain Ramsay were involved in a move down the left which allowed Ramsay to fire across Redmayne and into the far corner of the net. It was a goal which could and should have been prevented. Adelaide were now in total control as Heart gave the ball away repeatedly and then had to chase the game for significant periods, which John Aloisi later identified as one of the major failings of his team in this match. Eli Babalj replaced Tadic and when Jamie Coyne fell awkwardly and had to leave the field Golgol Mebrahtu came on in his place. This should have given Heart more attacking firepower but neither made much impression with the few opportunities they had. Adelaide absorbed early Heart pressure then started to play. After that Heart were never really threatening and in the end it was a most comfortable win for Adelaide. Michael Valkanis noted that Adelaide players had been in a comfort zone assuming that they were bound to make the finals, but some inconsistent performances have made them realise that they all have to buckle down to get the results they seek. John Aloisi quite rightly identified this as one of the most disappointing effort by his squad this season, but insisted that he and the team would move on and try to lift for the tough encounters coming up. What is certain is that Heart is going to have to be more ruthless when it gets chances to score early and much more resilient should it go behind. 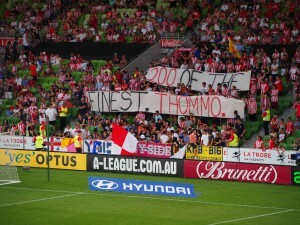 Heart fans' banner could not inspire a win on Matt Thompson's 200th game. 1.Eugene Galekovic, 3. Nigel Boogaard, 4.Jon McKain, 5.Iain Fyfe, 6.Cassio, 8. Marcelo Carrusca (22. Fabio Ferreira 82’), 10.Dario Vidosic, 14.Cameron Watson, 17.Iain Ramsay (18.Fabian Barbiero 88’), 19.Jake Barker-Daish, 25.Tomi Juric (21.Jeronimo Neumann 74’).